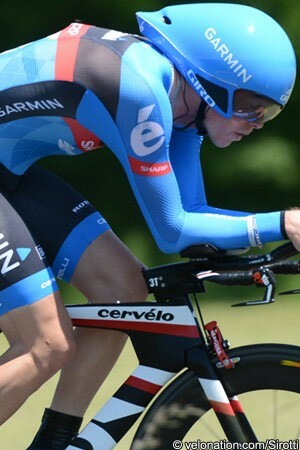 Garmin-Sharp CEO Jonathan Vaughters has given a thumbs up to both the performance and the ability of the 23 year old Australian rider Rohan Dennis, saying that the new Critérium du Dauphiné race leader could be in line to begin his first Tour de France later this month. Winner of gold medals for team pursuit in the world championships plus second in the same discipline in the Olympic Games, Dennis has also shown his class on the road. He won the Chrono Champenois and the Thuringen Rundfahrt last year while with the Jayco AIS team; in addition to that, he was winner of the mountains and young rider classification in the Tour Down Under, en route to fifth overall. He will start stage five of the Critérium du Dauphiné in the yellow jersey, five seconds ahead of Chris Froome (Sky) and 26 up on Michal Kwiatkowski (Omega Pharma-Quick Step). He said on Wednesday that he had initially been targeting the white jersey and was surprised to find himself in the overall race lead, but that he would do what he could to defend the maillot jaune.